The Philadelphia 76ers missed the playoffs for the first time in two years last season. The Sixers players never meshed with Head Coach Eddie Jordan’s Princeton offense and they sputtered mightily, gasping to a 27-55 record in 2009-10. This year the Sixers start the season with a new GM, Rod Thorn, who is perhaps best known for bringing Michael Jordan to the Chicago Bulls. Thorn hired Doug Collins as head coach and now the Sixers are poised to make some noise in the Atlantic Division, but for that to happen, Philly needs to work on the basics like perimeter shooting and defense. Rather than making the playoffs and scoring a lot of points in Jordan’s Princeton offense, the Sixers’ were exposed as undisciplined, unmotivated, and played without energy and passion. Conversely, Doug Collins will play the mentor role, developing and inspiring the Sixers’ young players. Collins is the polar opposite of Jordan and he’ll game plan to his players’ strengths rather than having them fit into a pre-planned scheme like Jordan did. However, Collins will have a hard time finding wins if he doesn’t improve the team dramatically with their interior defensive game. If he can shore up the defense this year then the Sixers might have a glimmer of hope to backdoor into the playoffs, but it is unlikely right now that is going to happen. The Philadelphia 76ers schedule starts by hosting Dwyane Wade, Chris Bosh, and LeBron James’ Miami Heat on Oct. 27 followed by another home game against Atlanta. Then the Sixers take to the road for two games at Indiana and Washington. The good news for Philly is they will play six out their last eight games at home, with the last four consecutive games at home to close out the season. The Sixers left no stone unturned when making moves this offseason. General Manager Ed Stefanski got demoted and Rod Thorn was named as Team President. Jordan got fired and replaced with Doug Collins. As for the players, Philadelphia dealt Samuel Dalembert to Sacramento in exchange for Andres Nocioni and Spencer Hawes. Long-time Sixer Willie Green and fourth-year forward Jason Smith were traded to Charlotte for veteran forward Darius Songalia, and 2010 first round pick Craig Brackins from Iowa State. Philadelphia might have had the steal of the draft by picking up Jrue Holiday 17th overall and he looks like he’ll start in front of the NBA’s overall second pick in the preseason, Evan Turner, a Naismith award winner. Finally, the Sixers have been having a hard time trying to dump Elton Brand, but there is little interest due to his albatross of a contract. Therefore, he is still on the team. Last year the Sixers were ranked 24th in defensive efficiency rating, but that should improve this year with top-five defender Andre Iguodala getting support from rookie small forward Holiday. Turner will help bolster the defense as well, but Philly did little to address their interior defense. Philadelphia will excel on perimeter defense, but that will only make opponents go to strong to the inside. The Sixers also have an excellent transition game, as they have a very athletic group of players. However, the problems for the Sixers include a lackluster half-court offense, awful defensive rebounding, and porous interior defense. The Sixers won’t contend for a title this year, or even the playoffs. However, if Philly concentrates on developing their young core players they should be back in the postseason in two years. The Philadelphia 76ers odds to win the Atlantic Division are +5000 and the odds double if you want to back the Sixers to win the NBA Championship at +10000. The oddsmakers set the Philadelphia 76ers ‘over/under’ at 33.5 total wins; a seven-game, or 24 percent increase in total wins over last year. 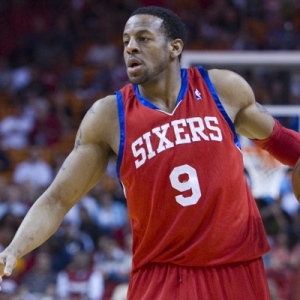 The Philadelphia 76ers won 27 games in 2009-10 and finished fourth in the Atlantic Division. NBA odds are courtesy of BetUS. Last season the Sixers were ranked in bottom third in most statistical categories from three-point shooting to defensive rebounding. Jordan’s Princeton offense was a bust and the Sixers suffered through a disastrous season. Will a new proven GM and a new head coach translate into seven more wins for the Sixers? Certainly the Sixers should win more games than last year, but I think 34 games is too much of a leap so I am advising playing the ‘under’ 33.5 total wins for the 2010-11 NBA season.